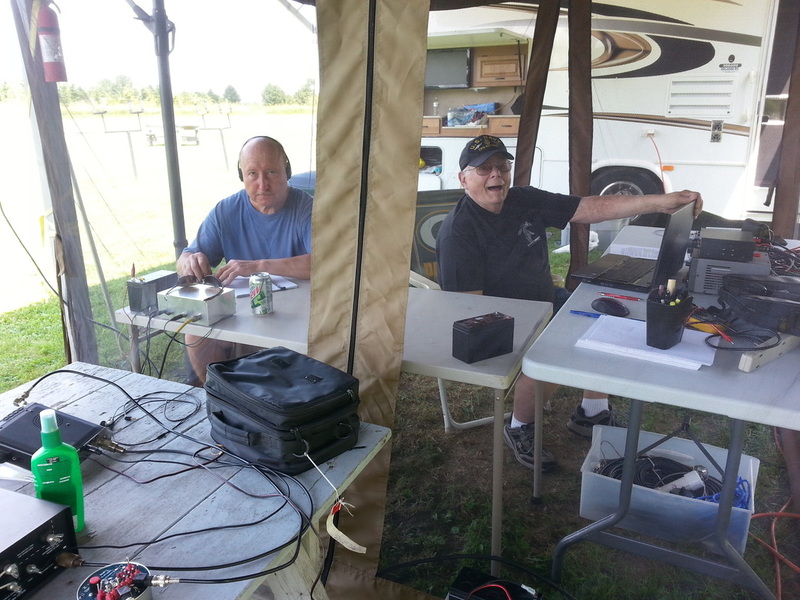 2015-06-28 Field day is an official event sponsored by the Amateur Radio Relay League (ARRL) on the fourth weekend of June every year. Hams across the country (and around the world) are encouraged to get outside, away from utility power, permanent antennas and operate "in the wild" using whatever they can get into operation quickly powered by batteries, solar panels, small generators or whatever. They must put up antennas in trees or on temporary supports in a place where they do not normally operate. The primary "mission" is to see how quickly and effectively we hams could get on the air should an emergency take away all the normal props of our comfortable homes, big antennas and electrical outlets and make contact with as many hams as possible. It challenges us to do our best under the worst of circumstances. A secondary "mission" is to have fun doing it! Some work in groups, both organized clubs and just several friends. Others go it alone. In our case we (me-K0BXB, Jerry-N9AC and Carl-AF9L) decided to do something on our own together. That is, we each set up and operated our own rigs and antennas but in the same tent. So over breakfast a few weeks in advance and through phone calls and emails and via 2 meters we determined that we would all operate QRP, what each of us would use for equipment and antennas, who had a portable "screen room", tables, batteries, etc. 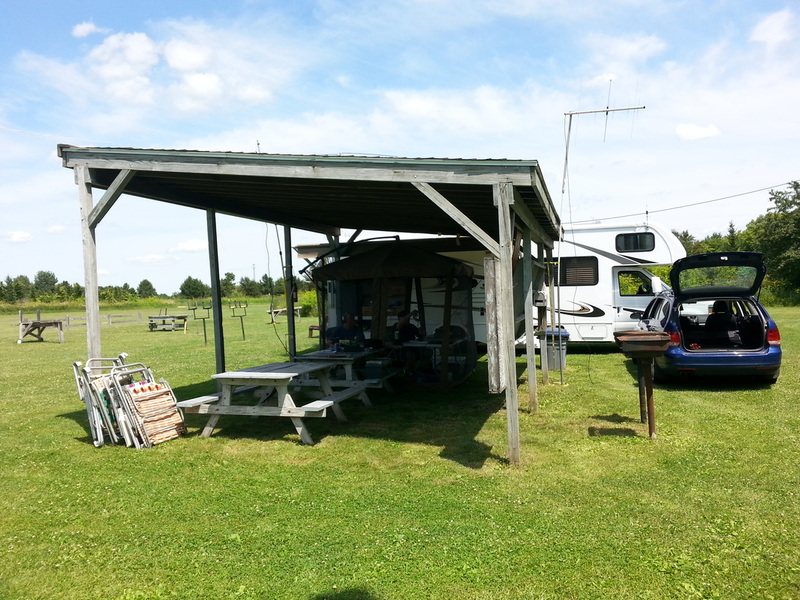 We met at noon on Saturday June 27, loaded our stuff into Jerry's motor home and headed to the Silver Eagles RC Club flying field about ten minutes west of Burlington, WI. The field which has no power, water or toilet facilities was graciously made available by the flying club and several members even came by during the 24 hours to see what on earth we were up to! About 45 minutes after arriving at the field I had my Yaesu FT-817nd on the air driving my G5RV Jr. antenna strung between two trees nearby and powered by its internal batteries and made two ten meter contacts. Just a short time later we were all up and operating. The main thing is that WE HAD FUN! As all field days should be, it was a combined effort. Jerry provided his motor home for comfort as well as the screen room for safety from the flying creatures, we each provided our own rigs and antennas, I brought along some food, most of which turned out somewhat better than just edible and Carl provided the levity. By about 2:00 pm we were all on the air . 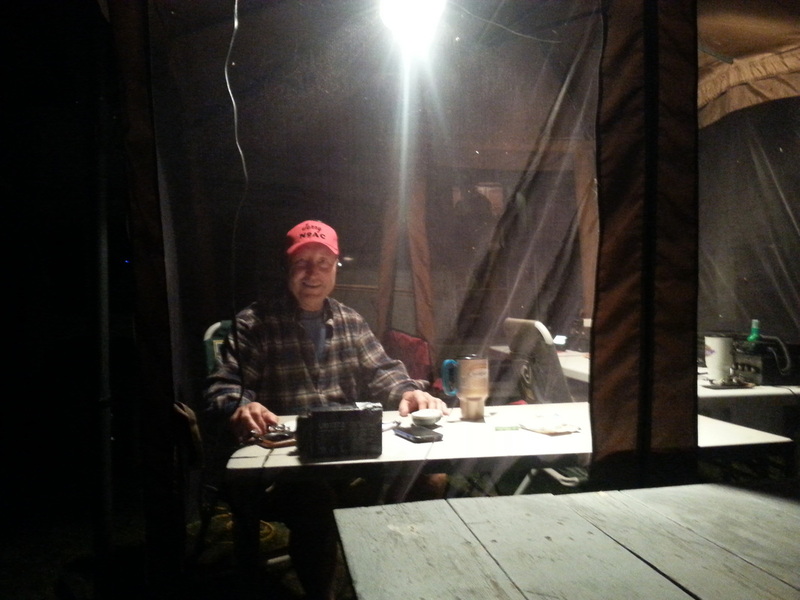 For gear, I had my FT-817nd Jerry had a home brew 4SQRP NS-40 transmitter, matching receiver and VXO, powered from a 7ahr battery and driving a 40 meter rotatable dipole made from a pair of hamstick like antennas. Jerry also had his Kenwood 480, powered from a generator/battery and in addition to his dipole used a Little Tarheel Screwdriver antenna. Carl had his new ICOM IC-7100 powered from a generator/battery setup using either his OFC antenna or a 2/440 yagi antenna. Having played around with portable antennas as part of preparing for my upcoming backpacking trip to Glacier National Park in July I also set up my end fed 51' wire and Tuna Tuna II QRP tuner which enabled me to get on 80 meters. We all operated at 5 watts. I think one of my conclusions after we closed up shop mid morning (June 28) was amazement that we had very little interference from each other even though our antennas were very close together. Another conclusion was that 5 watts works well. Sure having 100 or more watts would work better but we never lacked for contacts. Set up in Silver Eagles RC Flying Club shelter. Jerry N9AC left) and Carl (AF9L) in the "screen room" showing off their operating skills. "Late Night" didn't stop Jerry from adding to the log. The three of us combined made about 80 contacts. I had thirty on 20 meters, nine on 40 meters, four on ten meters and twenty six on 80 meters. Just as we were shutting down six meters was alive but none of us could get an antenna to tune on six. We knocked off around 11:00 pm and had a good night's sleep in Jerry's motor home. We got back on the air for a couple hours around 6:30 the next morning. Shortly later we had all had enough so packed up and headed home around 10:00 am. My most distant QSO was Washington State on 20 meters. My nearest one was on 80 meters with another Wisconsin station. All of my and Jerry's were contacts were CW. 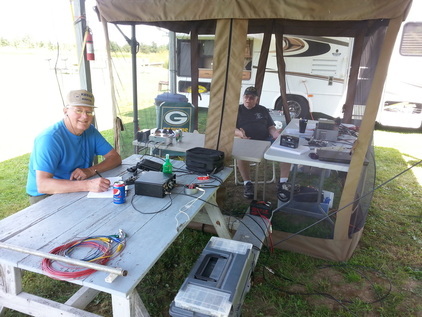 Carl also worked SSB and tried some PSK. Not sure if he actually had any PSK contacts. Propagation was very friendly. Almost every band provided strong signals and low noise. None of us had 160 meter capability but Jerry could hear some signals on the band. Ten was open at least part of the time too. I was amazed that my 51' end fed antenna provided a few 80 meter contacts but I used the G5RV Jr. for most other frequencies with a very old Ten-Tec tuner which tuned nicely on all but 80 and six meters. The G5RV Jr. is definitely a versatile, workhorse antenna. We had a great time and will likely look for some other interesting activities to do together. I learned several really important things from this experience. 1) If you plan to use Bisquick Shake 'n Pour (trademarked) pancake batter, don't pour in the water and then let it sit while you find the skillet or grill and get it heated up. If you do you will have a slightly colored very thin liquid with a thick glob of pancake flavored (I assume) gook on the bottom when you finally get to it no matter how hard or long you shake it. 2) Even though your skillet is "non-stick," it is a really good idea to treat it with some bacon grease or cooking spray prior to pouring on the pancake batter - unless you like a sticky glob of partially cooked "something" on your skillet! 3) a gas grill does not work well to cook bacon. 4) even with all of that you can have fun and actually enjoy some reasonable eats - which is one of the primary reasons you should do Field Day anyway! 5) If you are in Wisconsin, bring some warm clothes AND bug spray! Oh, one other observation, become good friends with someone who has a motor home. It'll make your overnight much more pleasant! If you have never done a Field Day, round up some friends and try it. I think you'll have fun too! Thank you Silver Eagles for letting us use your field. It was perfect!